And they're off! Click here to play! It's the sport of kings and you get the chance to join in on all the fun. Put on your finest hat and spend a day at the races cheering on your favorite horse while collecting top prizes. Have a glass of champagne while celebrating your latest win on the course. Five thoroughbreds will win 3333 times your original line wager. If you happen to spin two to five ladies decked out in their finest, you'll get up to 2000 times your wager. Five jockeys will get you 1000 times your wager. There are also several other symbols that will help you have a good day at the races. Trophies and binoculars can win up to 500 times your wager. A day at the races wouldn't be quite as fun without a little bit of gold in your pocket. If you manage to spin two to five gold horse coins anywhere on the board, your total bet will be multiplied accordingly. These will also reward you with free games in which all prizes are tripled and additional Horse and Coin symbols will be added to the board, making further wins all the more likely. So, get decked out, grab a glass of champagne and watch the horses race to the finish line while collecting a pretty hefty purse because it's a day at the races. Two or more golden coins anywhere on the board will multiply your total bet respectively. Two to five scatter coins will activate a bonus that awards the player with free games. 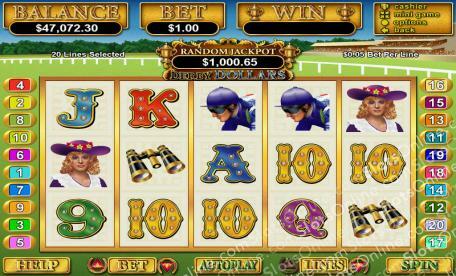 During the free games, all prizes are tripled and additional Horse and Coin symbols are added to the reels. The thoroughbred with mane blowing in the wind acts as a substitute symbol. It will replace all other symbbols except scatters. Five of these symbols will pay out 3333 times your original line wager.